BAGAN — Bagan is full of artwork and is the heart of Myanmar. Most visitors come to see the ancient pagodas and the stucco murals inside, and maybe visit the traditional lacquerware workshops. 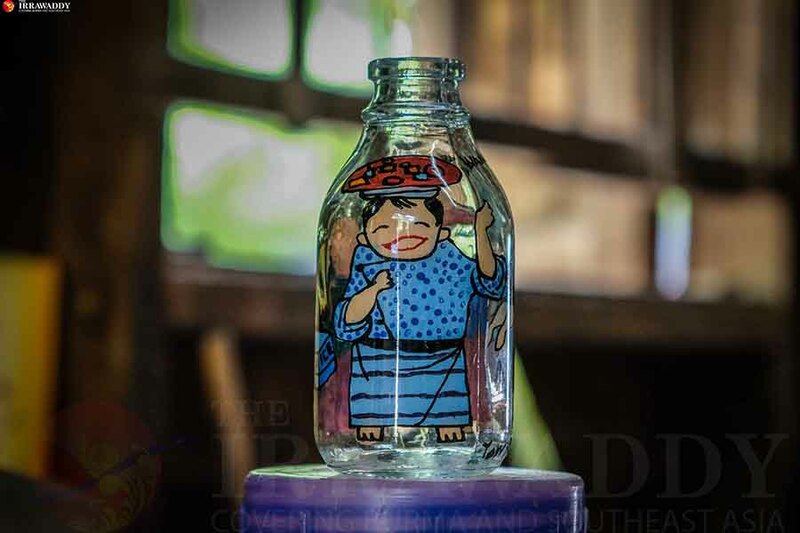 But another rare art form in Bagan is bottle painting, the art of painting the insides of glass bottles with images of people, animals and landscapes. It’s not easy, but Yaw Na Than loves to do it. 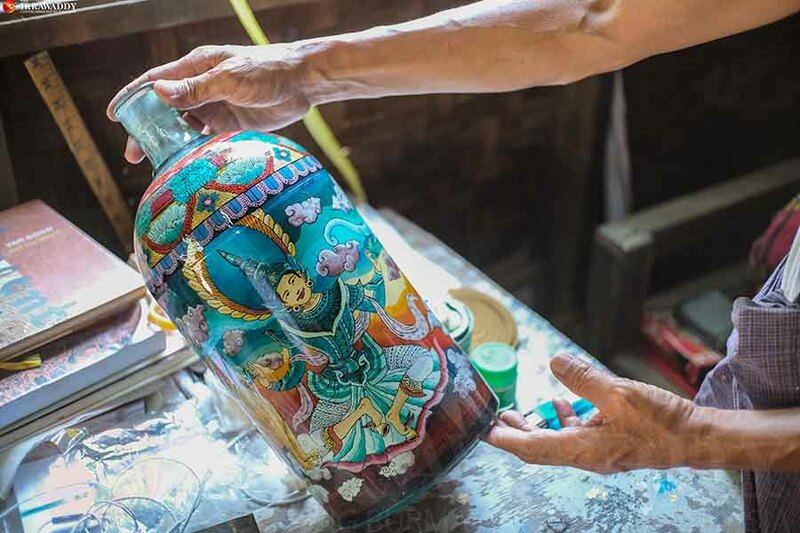 The 50-year-old artist is the only bottle painter left in Bagan and has turned his house into an eponymously named gallery to cut down on costs. His thatch home is in Nyaung-U, near Shwesikhone Pagoda. It’s a little hard to find, but locals are happy to point the way. A tiny signboard bearing his name sits at the entrance along with some of his work. Inside, a small table is cluttered with brushes, paint cups and bottles. “It takes about a week to do those small bottles because bottle painting is done with oil paints. So you have to wait for each layer to dry, and it takes patience. I need to paint each layer carefully,” Yaw Na Than said. He likes to paint scenes of playing children, monks and nuns, and the Bagan landscape. It’s very impressive. The artist’s effort, skill and imagination are all obvious in his work. Most of his customers are foreigners. 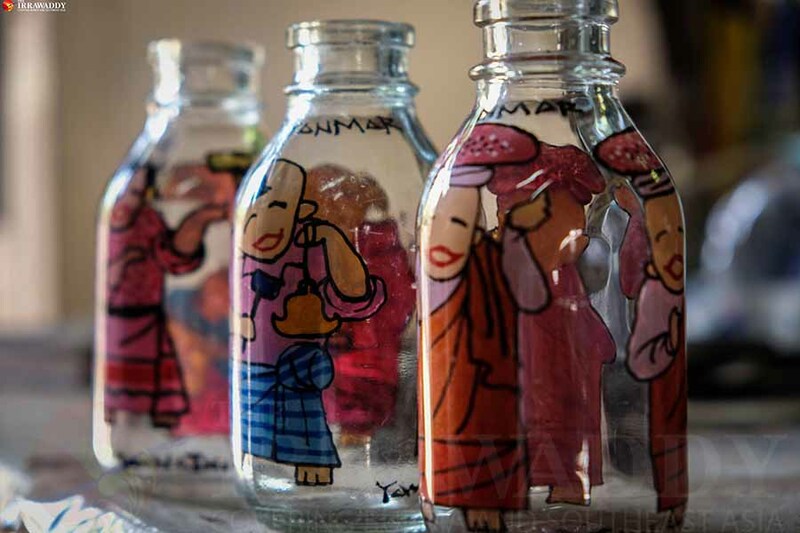 The smallest bottles sell for 10,000 kyats ($7.43) each. Larger bottles hang on the wall bearing the portraits of Vincent Van Gogh, Salvador Dali, Mahatma Gandhi and the Dalai Lama. “Those are $100 each because they’re more difficulty, take more time and need more concentration. Van Gogh bottles are the best sellers,” he said. Yaw Na Than said he can paint any image inside the bottles. But the bigger the bottle, the more time it takes. And the greater the detail, the higher the price. “Foreigners mostly buy the smaller ones because they’re easy to carry and aren’t heavy,” he said. 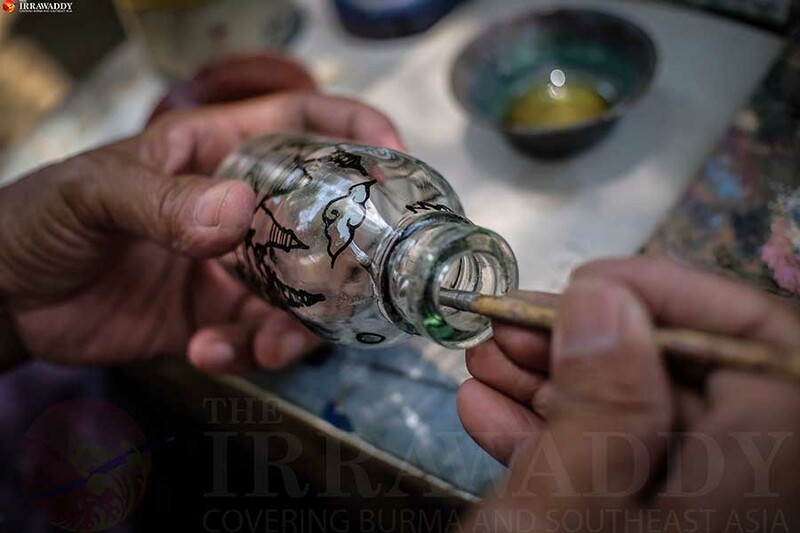 To paint the insides of the bottles, he needs to bend the tips of his brushes. It’s painstaking work and defies mass production. Yaw Na Than believes that’s one of the reasons it’s not very popular. “We’re losing peoples’ interest because we don’t have many products and customers have few choices. We can’t make the process very fast because it’s handmade. I paint to earn an income, but I paint what I love to draw,” he said. Yaw Na Than has also recently stopped painting bottles to focus on canvas and on organizing a solo exhibition. “Being an artist, I want to exhibit, and I have a sponsor. That’s why I’m spending more time drawing on canvas right now,” he said. “I am combining my main character, Van Gogh, with traditional Myanmar elements, characters and people. I have finished a total of eight paintings and am still working on the project. The exhibit will have a total of 15 or 20 paintings,” Yaw Na Than said. He said the show will open soon in Yangon. 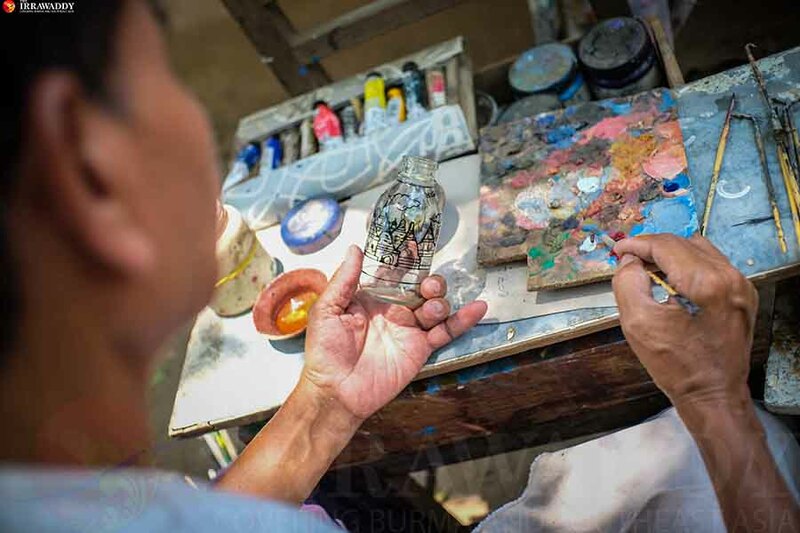 But as the only bottle painter left in Bagan, Yaw Na Than said he would also love the chance to pass on his 20 years of experience in the fine art to a new generation. “Once, a French art group asked me to teach them but I refused because I would love to teach our Burmese people first. But the youth are not really interested to learn. They just want to know the process and come to me to paint the pictures they ask for,” he said.